Alexander 'Xander' McGinley''Police appealing for information on his whereabouts after he was reported missing. Last seen on December 5, 2017. 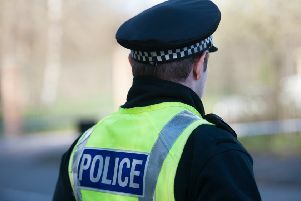 Police Scotland officers are looking for help to trace a man who has been missing since Tuesday. Alexander McGinley (29), known as Xander, was reported missing in the Larbert area. He was last seen at 6.15pm on Tuesday, December 5 leaving an address in Bramble Avenue. Xander is white, 5ft 6ins tall, of slim build with short dark hair. He has a distinctive tattoo with the word “Chip” on his forearm and a scar on the right side of his face. Inspector Catherine Sharkey, of Falkirk Police Station, said: ““here are growing concerns for Xander’s welfare and as part of our enquiries to trace him we’re urging anyone who may have seen him since this time to contact us. “Xander has links to the Grangemouth and Whitecross areas and we’d also ask any local residents in these areas who may have information which can help to get in touch. Anyone with information can contact Police Scotland on 101, quoting reference number 2421 of December 6.